This, the account of my last day in Mallangudi – the fifth day of my four-day stay – was put on paper in short spurts on the road going back to Karaikudi. It reads more like a shopping list, an inventory of items not to forget, snippets of moments or observations or questions or emotions that I knew I could call back to the forefront of my memory and describe in full detail once I began typing my handwritten words on an electronic keyboard. I was certain that I would be able to join the dots and then fill in the outlined forms with the rich palette of details that would surely materialize in my mind’s eye…but that is not what happened. What happened is that I typed up my diary of the previous four days almost immediately upon returning home to Karaikudi. Everything was still so fresh and raw: the tastes still lingered on my tongue and the children’s’ chants still resounded in my head. My back still ached from its nightly battle with a steel cot. My winter skin may have turned pink and my winter feet may have hurt, but my heart still danced with delight. And as I typed, my fingers danced too, to a light allegro (which is defined as “quick and bright”…an apt description for my stay in Mallangudi! ), while a smile was smeared across my face as continually as it had been during my sojourn. Early in the morning, Breetish performs a farewell dance for me. An interrogation: One of the many things here that still baffles me is kinship or lineage: most of the villagers are related (real blood relations), but how? They nearly never use each other’s given names. They all call one another by their kinship titles, like akka or chitappa, but the designation people use to address one another does not necessarily correspond with real blood ties. For example, I am “auntie” (when it’s children who are addressing me) or akka (“sister,” when it’s an adult). Now, this could be ascribed purely to a respectful way of addressing an outsider with whom one has a friendly relationship, but I think it is interesting that the designations that they use are family-relation ones and not just banal honorifics, like madam or sir. Within an extended family, cousins more often than not call one another sister and brother (and when pressed, will fine-tune the appellation to “cousin-brother” or “cousin-sister”); I have a friend who calls his father and his two uncles appa, and another who is hard pressed to explain just how the members in his extended family are related to one another! This is often the case, though, because of intertwining marital links within families. Cousin-brothers, best friends or both? Nagalingam, Shankar and Vishwanathan in 2008 and in 2014. 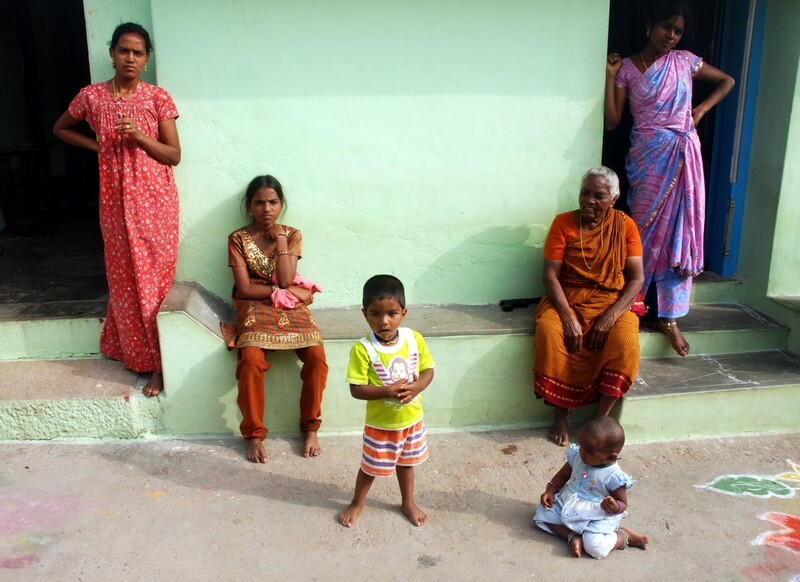 In village Tamil Nadu, where arranged marriages are by far still the rule, the most auspicious and privileged marriage is between first cousins: the bride is married to her father’s sister’s son (or, if it’s easier to understand: the groom is married to his mother’s brother’s daughter). If that perfect union cannot be made, families will go both vertically and horizontally through the branches of their genealogy so that small villages, like Mallangudi, appear to be more like a spider’s web than a tree. Or if a tree, then a tropical banyan with aerial roots all tangled and twisted together. This family network is anything but obvious, and understanding who is related to whom and how is something I have tried to grapple with for many years and in nearly every village I’ve spent time in. Just to put a confused smirk on the face of the reader of these lines, below is an entry in my journal dating from 2006. I have left it unedited (which will probably add to your confusion!) and I will not explain who these people are because frankly, that is unimportant…and may confuse you even more! Kashi’s wife is his Periyappa’s grand-daughter. I was a bit confounded by the generational difference (Kashi’s father is Periyappa’s youngest brother) and, though it was explained to me with great care (how Periyappa was ten years older than Kashi’s appa…) I am still a bit confused by it: Kashi’s amma (“Amma”) is very close to Kashi’s wife’s mother: they are about the same age but Amma is her aunt (by marriage). As well, Amma is Kashi’s wife’s great-aunt but also her mother-in-law. All of these marriages within the enlarged family are very frequent in the families I have encountered. Subbaiya is Kashi’s first cousin (as is Kashi’s wife’s mother! ): his mother was Kashi’s father’s older sister. Likewise, Subbaiya went the other day to a relative’s home in order to start the marriage negotiations between his nephew and a niece (or the cousin of a niece, or the niece of a cousin…). I started thinking how these marriages actually work in the woman’s favour…What I mean to say is that contrary to all the stories one hears of a newly-wed girl falling into a lion’s den upon arrival into her husband’s family, a bit like Cinderella with a vengeful mother-in-law and ruthless sisters-in-law and unfulfilled dowry promises hanging on like dangerous and even lethal pests, this in-family marriage arrangement can actually be self-asserting for a woman (a girl, usually, upon marriage). After all, the bonds are already woven by blood ties; her position in the family is already assured. And where love is not mentioned, this probably has a positive impact on her comfort within her new family. The blood ties have already given her certain rights in her new surroundings, which are not new anyway: they are familiar surroundings and relatives and people who also have her interest in mind in a similar but transformed family structure. It was seven o’clock and I was just sipping the piping hot tea that Indurani had prepared for me when JR came to fetch me so that I could watch the slaughter of the natu kozhi (literally “country chicken”) that they would feast on for lunch. I hesitated following her. I asked myself, do I really want to witness this? I was a vegetarian…she knew that! But she also knew (for I had told her before I came to Mallangudi) that I wanted to take part in village life as fully as possible: to participate when I could and to observe when I couldn’t participate…and watching the slaughter of the natu kozhi certainly fell into that second category. I followed JR to the “corral” and when we arrived, Krishna, Muthu and Ravi had slaughtered a goat and had just finished skinning it. The decapitated carcass was hanging from a wooden beam by its hind legs (the forelegs had already been severed from the body) and though blood was no longer draining from the recently butchered animal, it still laid in shallow pools on the white plasticized sheet covering the ground under the carcass. When I arrived, Ravi was already holding the chosen-to-be-lunch chicken (in fact it was a rooster) upside-down by its claws, and we watched (together with Muthu and a half-dozen enthusiastic Mallangudi onlookers) as Krishna started taking the dead animal apart: first, by removing the entrails (and with it, batches of blood that had coagulated near, I imagine, the heart and lungs), and then, by carving into the flesh with a few strokes of a very sharp knife, it looked more like he was disassembling it into its natural subcategories than merely cutting it into pieces. I am not saying this to make the deed more palatable (no pun intended) to my vegetarian (turned vegan) ethos. I am against the slaughter of all sentient beings, and the fact that this goat was killed “artisanaly” rather than in a horrifying industrialized slaughterhouse doesn’t change the end-result: the goat was killed. But on that day in Mallangudi, I was there not to pass judgement, but only to observe (and here, to narrate what I witnessed). Those who are reading these lines may want to call me a hypocrite, for just yesterday I condemned my village friends for their lack of basic environmental concern. In my defence, I make a clear distinction between on the one hand, a cultural convention (eating meat), and on the other, a cultivated routine (not recognizing nor appropriately disposing of trash). Again, this doesn’t make the killing of the goat any more acceptable on a gut-level, but certainly gives me the necessary neutrality to watch it being done. It would be more honest to say that it gives me the necessary intellectual neutrality. The emotional neutrality – the ability to watch a still-warm animal being cut to pieces or, on numerous occasions (due to my long years documenting festivals in Tamil Nadu in general and festivals dedicated to the local, rural god Ayyanar, in particular) the sacrificing of animals (goats for the most part) – is just as crucial, at least for me. The only way I’ve learned to achieve emotional neutrality, the only way I can watch these joyful, trusting, docile creatures get their heads severed in one clean strike without tears of helplessness or my heart racing to an unhealthy rhythm, is to put something between me and the victim. That something is a viewfinder. The viewfinder I used today was attached to a video camera. Just like the moments spent observing Krishna dismembering the goat, the ritual slaughter of the natu kozhi was captured on video, and thus I have no visuals to share on these pages. No photos (do I hear a sigh of relief? ), only words. But shall I give a detailed description of the sacrifice? I think not. After watching the video clips again and again in order to refresh my memory (remember, I am writing this three and a half years after the fact), I do not feel it is important to give a play by play depiction. Instead, I’ll use the images and the emotions that those videos evoke in me as a catalyst to articulate thoughts of a grander, more serious nature than the simple sacrificial slaughter of a chicken. I mentioned at the beginning of this text that I would speak about what eventually came to pass many months after my stay in Mallangudi. That moment has come. Exactly one year later, Ravi died. Renal deficiency led to total kidney failure and uremic poisoning, and on Matu Pongal of 2015, Ravi – my sweet, kind, talented, beautiful thambi – shed the body that had betrayed him when he closed his eyes for the last time. He was 22. I have written of Ravi all throughout these pages, for we were very close. But just as importantly, he was central to my being in Mallangudi in the first place. Just to recapitulate for those who may not know: I first discovered Mallangudi in 2006 during the earlier years of my ten-year documentation of the Ayyanar cult, upon learning that the potters who lived there produced the marvellous terracotta offerings at the Ilyangudipatti shrine situated eight kilometres away. From that moment on, I became a frequent visitor to the village, at first working with the very few men who were still practicing their sacred art, and very quickly spending time there just because I really liked the place and I really liked the people. Especially Jayaretina: her warmth and generosity hooked me from the start. 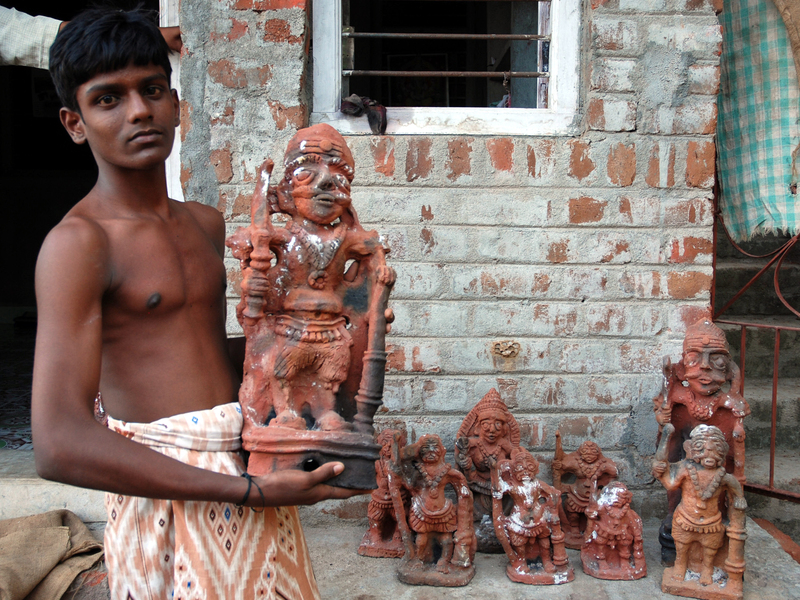 As it happened, Krishna (Jayaretina’s husband) was one of the few men living in the village and one of only three village men who still made the annual terracotta offerings to Ayyanar. 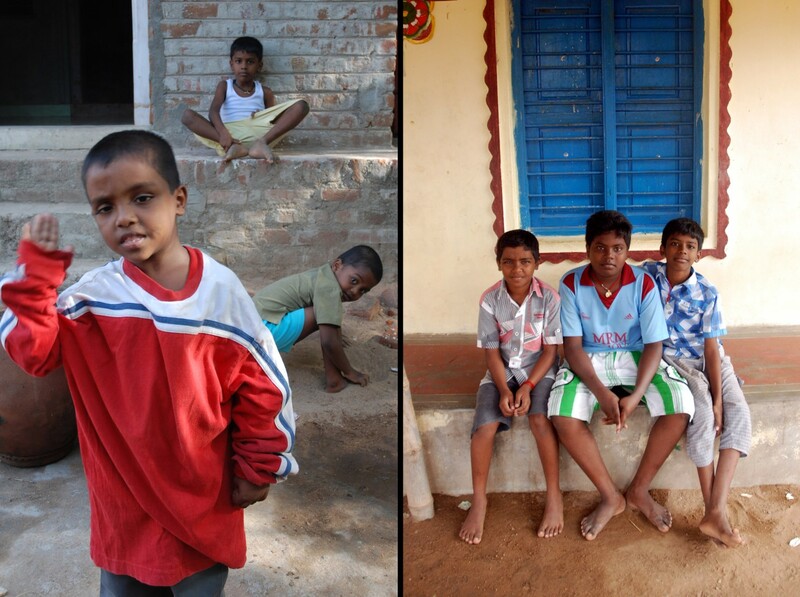 Their young son, Ravi, about 13 when I first met him, was frail, withdrawn and self-conscious. Ravi was the only young person in the village who did not go to school; he had stopped the year before because of incessant teasing from his classmates due to his deformity (children can be brutal anywhere in the world). On school days, Ravi would stick around the village and help his mother (or play with the village young children) or sometimes go with his father to work (Krishna had a bicycle repair shop in the next village). 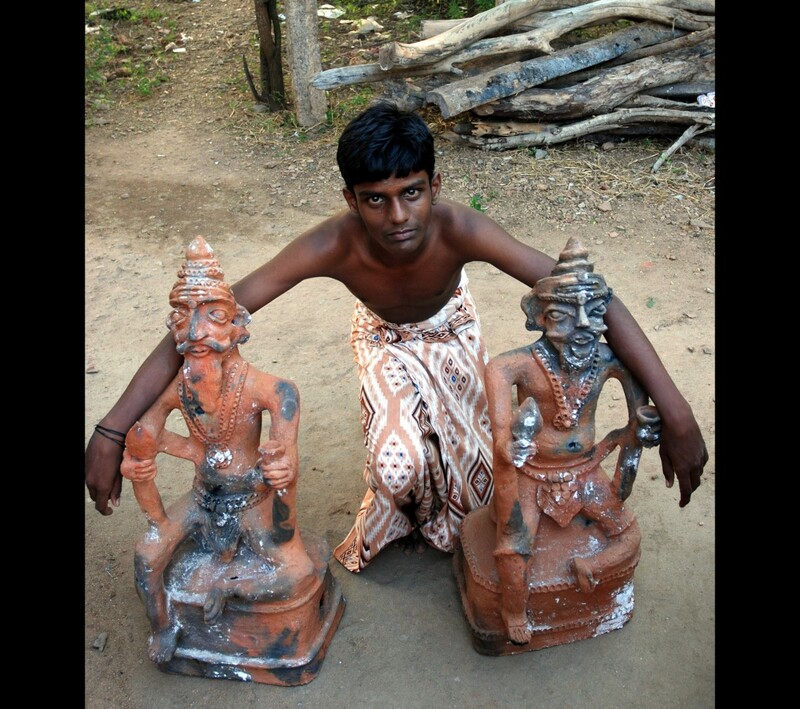 And because he was not destined to go to college like all his fellow village cohorts, and also because he took an interest in pottery, Ravi had learned the basics of clay creation. He was, in fact, the only young man in the village who had learned how to work in clay. In Mallangudi, Ravi was the unique link between the entire village’s ancestral occupation and the continuity of their craft. From the moment I met Ravi, I was interested in seeing what he was able to create. I knew that Ravi assisted his father, but since I wanted to know what Ravi was able to do independently from Krishna, I would place orders with each one separately. And I was not mistaken: Ravi was very talented. …and a slew of smaller Karappu-sami statues. The rest, as they say, is history. I began ordering pieces from Ravi only. I knew that the larger pieces would be made as a joint-effort of father and son; I knew that the more physically challenging aspects of the clay creation (the preparation of the clay, for instance) would be accomplished by Krishna; I knew that Ravi was still far from mastering the art of firing…But I also knew that the division of labour would be justly divvied out, and that both Jayaretina and Krishna were overjoyed to see their son’s talents recognized and nurtured. We went into Ravi’s “house” and Jayaretina showed me what Ravi had made to surprise me. Each time I am touched and even a bit flabbergasted by what this young boy can do. It’s as if his awkwardness, his shyness, his illness transform form itself into grace, gumption, grandeur. His artistry is quite fine but what is grand, great even, is the importance his artistry has given him over these past years. I admit to being personally touched, moved to tears even, when Jayaretina showed me the mirror Ravi had bought and hung in his room: he had the name Julie (written à la Tamil: Julee) etched in large yellow letters in the corner. I realize how important I have been to his growth and of course I am pleased and proud but more than that I feel deeply affected to have witnessed him blossom and become a young man with more confidence and pride than even his parents thought possible. The role I have played in his life is not negligible. And though I didn’t start off assuming this role or even imagining I was playing a role in the first place, the fact remains that by encouraging him, by trusting him to create autonomously, by enthusiastically and utterly sincerely responding to his work and his intuition and his primal aesthetic senses, I have given him a gift his family could never give him and that he would probably never have had otherwise due to his deformity and to his fragility: the gift of feeling like an individual, like someone who exists fully as himself, by himself, outside his family, outside his village, outside his protective, collective unit. For somebody like Ravi, this is a great gift and I feel immense joy knowing I have given it to him. And it is clear to me that he deserves it. So now the reader knows, if there was any doubt, just how much Ravi meant to me…and how devastated I was by his death. And the reader can also surmise that watching the videos and writing today about the animal sacrifice that took place more than three years ago on my last day in Mallangudi are tinted with a poignant shade – stained indelibly by Ravi’s demise one year after those images were captured. How can I not notice the symbolism, the symmetry, even, of that trusting, defenceless rooster going unknowingly to his end and Ravi’s last months? In a minute-long sequence that was moving at the time but even more so now, as Jayaretina busies herself with the puja preparations, Ravi stands next to the anthill (which had the sacred function of a shrine) holding the rooster securely but gently in his right hand and stroking the bird’s feathered back with the other. He looks at the camera, smiles ever so tenderly, and then lightly pats the rooster under the neck, a gesture that I associate with the petting of a beloved animal companion. The rooster was then tucked against Ravi’s hip; immobile and mute, he seemed to be peacefully examining the preparations for his own slaughter, as if he accepted his lot, as if he realized that struggling against his destiny was merely wasting the last precious drops of life still flowing in his body. I do hope the reader will excuse my lapse into anthropomorphism. And understand, as well, that I am not comparing the slaughter of a rooster with the death of Ravi, or regarding them with equal solemnity. Of course not. But these were my thoughts while watching those images reappear on my screen and in my heart. Ravi severed the rooster’s head with lightning speed and placed it on the anthill as an offering to the divine. We collected the puja paraphernalia and brought it back to the house, and Jayaretina and Indurani started preparing the dishes that we would feast on for lunch. I watched them for a short while, and then went house to house, saying goodbye and see-you-again-soon to all my friends in Mallangudi. Suresh, my driver, would be coming to collect me right after lunch, to bring me back to my home in Karaikudi. 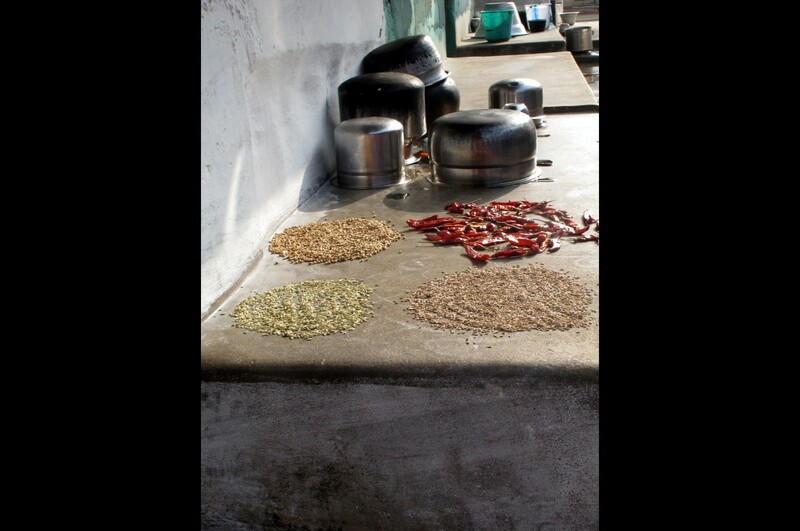 The spices for our lunch drying in the sun. When lunch was ready, Jayaretina called us all to come. And for my last meal in Mallangudi, and the very first time since I had arrived, the whole family sat down to eat together. Jayaretina and Krishna, Muthu and Indurani, Ravi and I, together we celebrated life and love and the bounty of creation. And yes, I did eat the natu kozhi.